The Kobo Arc is receiving an update to Android 4.1 Jelly Bean and all of the goodness that goes along with that. Kobo isn't a name you hear that often in the United States any more, but the brand has caught on elsewhere in the world. During a trip to England last Nov., I was shocked at how many different stores I saw selling the full line of devices, some of which I hadn't even heard of as of that time. Amongst those devices you may not be familiar with is the 7-inch Arc tablet. This unassuming little tablet is going to bet a boost to its power with the announcement today that it is being upgraded to Android 4.1 Jelly Bean. Yep, you'll now have the ability to access Google Now, use Face Unlock and all of the other goodies that came along with this update to the Android OS. If you have an Arc, switch it on, connect to some Wi-Fi and get to downloading! Toronto, ON – March 21, 2013 – Kobo, a global leader in eReading, today announced its Android™ 4.1 Jelly Bean firmware update for Kobo's award-winning 7" Google-certified Kobo Arc tablet. This update optimizes the user experience with faster performance, improved search capabilities, increased touch responsiveness, and additional intelligence features to help organize and streamline information with actionable notifications. The update is now available to Kobo Arc customers when they next connect to Wi Fi. "Kobo Arc is the perfect tablet for people that love consuming books, movies, and surfing the web," said Wayne White, EVP of Devices, Kobo. "With the latest Jelly Bean update, Kobo Arc becomes the perfect eReading companion that offers more with intelligent search recommendations, voice-to-text, and a highly responsive touch screen." Google Now™: Perfect for on-the-go Kobo Arc users looking for an easy way to organize their busy schedules, Google Now personalizes information based on a user's location, time of day, history, and calendar events. Google Now shows restaurants in the area, how much traffic to expect before the morning commute, when the next train is coming, the score of a current game, a flight status, and more. Richer notifications: Kobo Arc users will never miss a beat due to a richer notification experience. They can now action notifications directly within the notifications area as well as expand and collapse notifications to display more or less detail. Face Unlock: Keeping the Kobo Arc secure has never been easier with the improved Face Unlock, which now calibrates in different conditions and can now optionally require a blink to verify a live person is unlocking the device. In addition, users can feel safer with improvements in malware blocking. 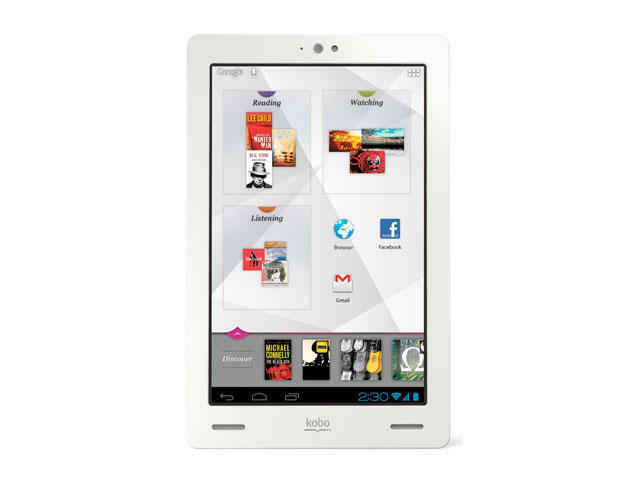 Kobo Arc is a sleek 7" Android multimedia tablet with full access to the Google Play™ store, with access to more than 700,000 apps and games. It provides users with a new way to discover content – eBooks, movies, TV shows, music, web pages, and more. Kobo's exclusive interface, Tapestries, allows users to collect and curate content of interest in dynamic, visual Tapestries by "pinning" content to the home screen. The Kobo Arc's Discover Ribbon recommends related content based on the items pinned to Tapestries. The more users collect in their Tapestries, the more the Kobo Arc learns what they love and provides them with more engaging content. The device has a high-definition display that delivers crisp, sharp text, and with more than 16-million colours, brings photos, videos, and games to life. With front-facing speakers enhanced by SRS TruMedia™, a built-in microphone, and a front-facing camera, Kobo Arc provides 10 hours of continuous reading or video play and two weeks on standby. Kobo Arc is available with 16GB, 32GB and 64GB configurations at local retailers.